Home/News/National/FACT CHECK: What’s Happening On The U.S.-Mexico Border? 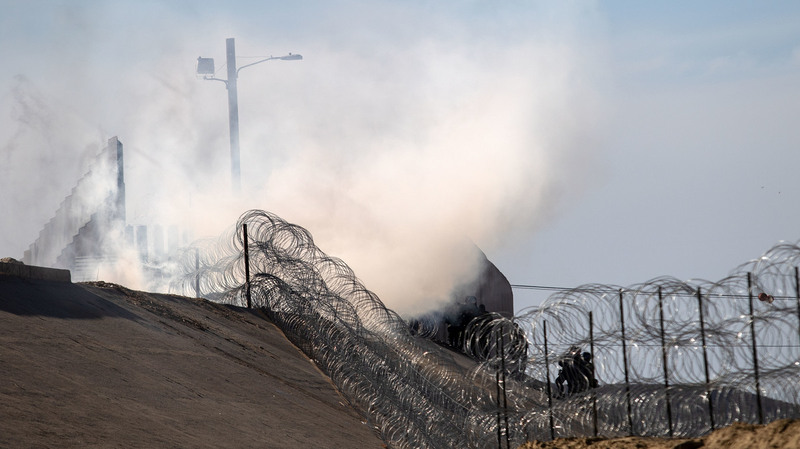 Tear gas thrown by the U.S. Border Patrol is seen near the El Chaparral/San Ysidro border crossing in Tijuana, Mexico, on Sunday. On Sunday, for instance, U.S. agents closed a major border crossing and fired tear gas on migrants attempting to cross into the U.S. from Tijuana, Mexico. The migrants, many of whom had been part of a caravan of Central American asylum-seekers, were protesting the slow pace with which the U.S. has been processing asylum claims. For supporters of President Trump who advocate a crackdown on immigration, the events of Sunday showed migrants storming a protected border, confirming fears of an "invasion" of migrants defying U.S. laws. For Trump's critics and pro-immigration activists, the scene showed American patrol agents firing tear gas at an unarmed crowd including children, reinforcing horror over the way the U.S. is treating immigrants. Here's what we know about what's happening on the border. Is the U.S.-Mexico border currently closed? No. The border has not been shut down. One port of entry was temporarily closed for a few hours on Sunday, but has since reopened. The port of entry in question — San Ysidro — is a big one. It's the busiest land border crossing in the western hemisphere. An average of 90,000 people pass north through the crossing each day, 70,000 in cars and 20,000 by foot. Could President Trump seal the border if he wished? Yes. It is difficult to completely secure a border more than 1,900 miles long, but ports of entry could be shut down, as USA Today explains. There is some precedent for such an action, although it's extreme. And as Quartz notes, that would only delay — not eliminate — the United States' legal responsibility to hear asylum claims. A group of Central American migrants climb a metal barrier on the Mexico-U.S. border in Tijuana, Mexico, on Sunday. U.S. officials closed the San Ysidro port of entry in southern California on Sunday after a group of migrants tried to breach a fence from Tijuana. How many people are waiting in Mexico, hoping to cross into the U.S.? More than 5,000 migrants from Central America have reached the border town of Tijuana, as part of the caravan that traveled some 3,000 miles. Most are from Honduras, where gang violence is widespread and a 2009 coup triggered an ongoing political crisis. The U.S. has long played a key role in Honduran politics. 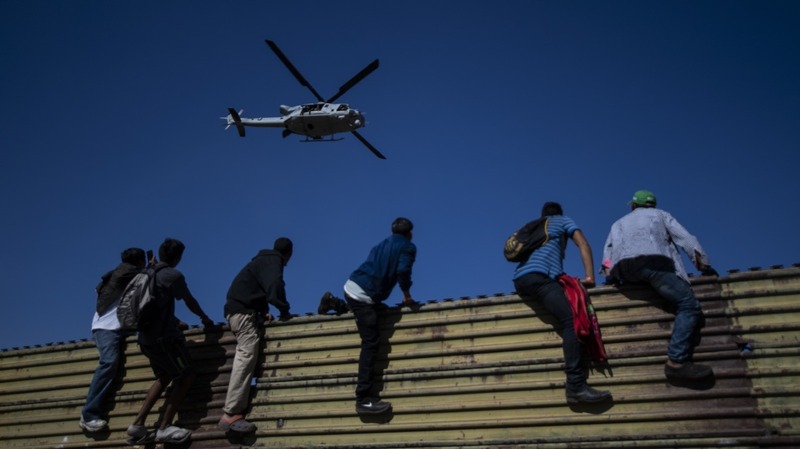 All told, more than 7,000 migrants with the caravan have reached the state of Baja California, where Tijuana is located, according to the Mexican government. And there were other migrants waiting in Tijuana even before the caravan members began to arrive, Fredrick notes. Several hundred migrants were involved in the confrontation on Sunday. Why were the migrants protesting over the weekend? Many of the migrants say they want to seek asylum in the U.S., which is not illegal — in fact, the right to seek asylum is protected by both U.S. and international law. Seeking asylum means asking the U.S. to accept you — legally — because of persecution you are facing in your home country. Crossing the border illegally is a misdemeanor; for a person who has already been deported once, it's a felony. Both types of crimes are currently being prosecuted with no exceptions, even if a person later requests asylum. Seeking asylum at a port of entry, however, is not a crime at all. However, authorities at legal border crossings have been limiting the number of people who can request asylum. Only 40-100 people are allowed each day, Fredrick says. "People in the caravan who want to request asylum, they're looking at months to even be heard first by U.S. authorities, and then for that claim to be processed can take months or even years," Fredrick tells NPR. Migrants were protesting that delay. A spokesman for CBP told NPR's Joel Rose that San Ysidro is limited by its facilities, which can hold up to 300 people, and that the port of entry can process about 100 people per day under ideal conditions. The federal government is aware that asylum seekers face a backlog. A report from the Department of Homeland Security's Office of Inspector General published in September described the issue. The U.S. government has encouraged all asylum seekers to go to ports of entry, rather than along the rest of the border. At the same time, authorities are limiting the volume of asylum seekers allowed at ports of entry. The "competing directives" have created a backlog, OIG found, likely causing more migrants to enter the country illegally. 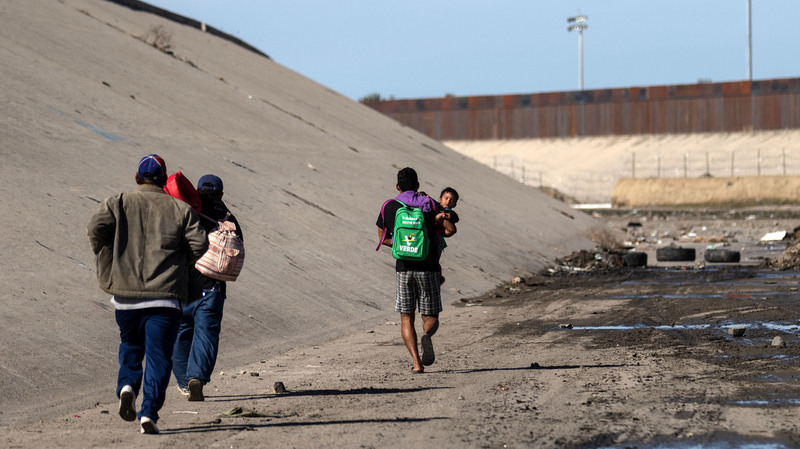 Earlier this month, the Trump Administration announced new measures aimed at denying asylum to migrants who enter the country illegally. A federal court later blocked that effort. Central American migrants run along the shallow concrete waterway of the Tijuana River,in Tijuana, Mexico, on Sunday. It was a peaceful protest at first, says Fredrick, who witnessed the events in Tijuana. Mexican federal police attempted to contain the crowd, but some migrants were able to pass the Mexican police. "They went down into this kind of riverbank, where there is not that giant steel fence that divides the U.S. and Mexico," he says. "It's a chain link fence and barbed wire. A group of them started pushing up against that fence." At that point, U.S. agents began firing tear gas into the crowd for the first time. Tear gas was used again several times. It was a windy day, and the tear gas drifted more than half a mile, Fredrick reported Sunday. Families with children, far from the fence, felt its effects. Ninety-eight migrants were arrested by Mexican authorities south of the border. Rodney Scott, chief patrol agent of the San Diego Sector Border Patrol, told CNN on Monday that about 42 people were arrested on the U.S. side of the border, including eight women and "a few children." Some of the migrants threw rocks, and border patrol agents "deployed tear gas to protect themselves and to protect the border," Scott said. He said several agents were struck by rocks but were not injured, because they were wearing tactical gear, including helmets and bulletproof vests. What's the role of the military along the border? President Trump has sent nearly 6,000 U.S. troops, including military engineers and military police, to the U.S.-Mexico border to support Customs and Border Protection. The military police are not supposed to carry out law enforcement duties, but they can protect CBP officials. While local police and CBP agents have firepower, military leaders and spokesmen have repeatedly said that the military police at the border are unarmed. Secretary of Defense James Mattis said Wednesday that military police would carry shields and batons, not firearms. Armed Border Patrol tactical units are deployed at the border, to protect Border Patrol agents. Backing up these tactical units are unarmed military police with protective shields and batons. The military police are not supposed to engage migrants but are there in a support role to back up the Border Patrol. A total of 1,800 troops are in California as of Monday, an increase compared to recent weeks. Some of the military police — it's not clear how many — participated in the border action over the weekend. U.S. Northern Command tells Walsh the military provided non-lethal assistance and did not have contact with migrants, and were not involved in deploying tear gas. It's not yet clear what their role was. Does the military have authorization to use lethal force? President Trump has said that he's "given the OK" for U.S. forces to "use lethal force" against the migrant caravan. But according to a White House memo from last week, which was acquired by multiple media outlets, the decision to use lethal force is limited to protecting federal agents — and at the discretion of the Secretary of Defense. And Mattis, in a briefing last week, said that the Department of Homeland Security has issued no call for lethal force. On Monday, CBP described the military's role as helping put up barriers along the border — with no mention of force. The memo expanding the military's powers was signed by White House chief of staff John Kelly, which is unusual. It was reportedly opposed by both Secretary of Defense Mattis and Secretary of Homeland Security Nielsen. U.S. troops have always had the right to act in their own self-defense. 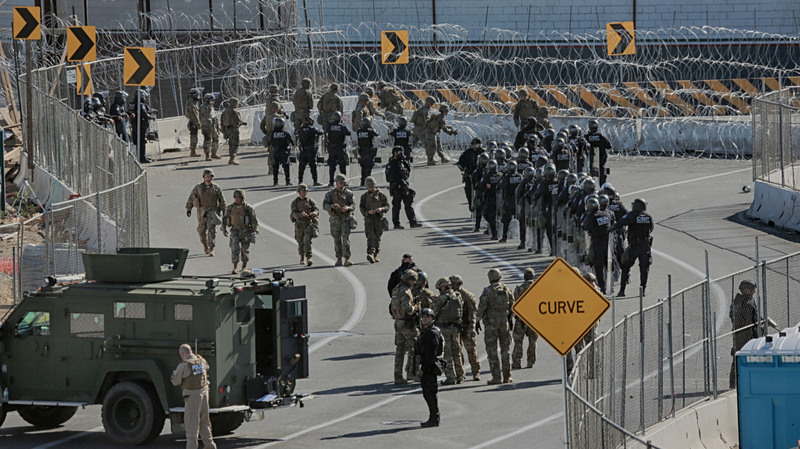 U.S. military personnel and Border Patrol agents secure the United States-Mexico border at the San Ysidro crossing point south of San Diego on Sunday. Are the number of border crossings increasing, or at a historic high? No. As NPR's Joel Rose reported this month, the total number of migrants apprehended at the border is actually down slightly, to about 521,000, and remains far below the numbers that were routine in the 1990s and 2000s. The difference, according to the Trump Administration, is the kind of migrants now turning up at the border. In the past, migrants were largely single adults who could be deported quickly. Today's migrants are more likely from Central America, and are more likely to be part of family units. That means they have greater protections under U.S. law and it may take months or years to deport them. In the meantime, hundreds of thousands have been released into this country, awaiting their day in court. Has the U.S. made a deal with Mexico that would keep asylum seekers south of the border as their claims are processed? It appears that the initial reports of a deal between the U.S. and Mexico to keep the asylum-seekers in Mexico were premature, but not inaccurate. The Washington Post first reported on Saturday that a tentative deal with Mexico had been reached, adding that "no formal agreement has been signed." "According to outlines of the plan, known as Remain in Mexico, asylum applicants at the border will have to stay in Mexico while their cases are processed, potentially ending the system, which Trump decries as 'catch and release,'" that has generally allowed those seeking refuge to wait on safer U.S. soil. "For now, we have agreed to this policy of Remain in Mexico," said Olga Sánchez Cordero, Mexico's incoming interior minister, the top domestic policy official for López Obrador, who takes office Dec. 1. In an interview with The Washington Post, she called it a 'short-term solution.'" "The medium- and long-term solution is that people don't migrate," Sánchez Cordero said. 'Mexico has open arms and everything, but imagine one caravan after another after another. That would also be a problem for us.'" Within hours, the incoming-Mexican government appeared to pull back from the deal. In a statement, Sanchez-Cordero declared that "there is no agreement of any kind" between the U.S. and Mexican governments, "since the next president, Andres Manuel Lopez Obrador, will take office on December 1." However, the statement doesn't really deny that there have been some negotiations between the two countries on how to handle the migrant caravan. It also implies that Obrador's in-coming government cannot yet announce any deal, if there is one, because he has not taken authority. The statement does say that Mexico won't become a "safe third country" for the asylum-seekers. That refers to a specific arrangement sought by American officials under which the Central American migrants would be required to seek asylum in Mexico rather than in the U.S. As The Post reported in July, the Mexican government never warmed up to that idea. Under the so-called "Remain in Mexico" policy, the Post reports asylum-seekers would be screened in interviews allowing them to claim a "credible fear" of persecution in their homeland if they return there. They would also have to establish a "reasonable fear" of persecution in Mexico if they remain there. Only those determined to have a "reasonable fear" of staying in Mexico would be allowed into the U.S. to await an asylum hearing. All others would have to wait in Mexico to apply for asylum. Immigrant advocates say they are monitoring the reports of negotiations between the two governments. "We are going to wait to see precisely what the president proposes," said Lee Gelernt, an attorney with the American Civil Liberties Union (ACLU) in an interview with NPR. "But one thing we know right off the bat is that it cannot be legal unless they can assure all the asylum seekers who will be stranded in Mexico … will be safe — not only from persecution by state actors in Mexico, but by criminal gangs. And from what we know about what's going on, we see no likelihood that that is going to be true. And so because that's part of the legal analysis, whether the asylum seekers will be safe in Mexico, we can't imagine any proposal will be legal."